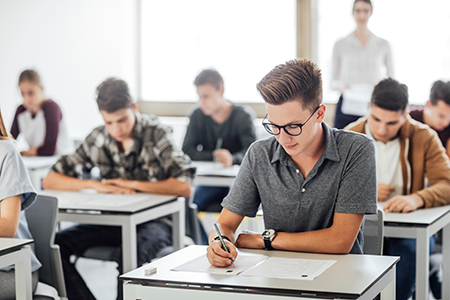 On August 13, 2015, HB 3428 was signed into law amending The College and Career Success for All Students Act (Public Act 099-0358) which now provides that a student who takes a College Board Advanced Placement examination and receives a score of 3 or higher on the examination is entitled to receive postsecondary level course credit at a public institution of higher education. The Act requires each public institution of higher education to comply with the same standard of awarding course credit to any student receiving a score of 3 or higher on a College Board Advanced Placement examination and applying the credit to meet a corresponding course requirement for degree completion at that institution of higher education. Beginning with the 2016-2017 academic year, each public institution of higher education shall determine for each test whether credit will be granted for electives, general education requirements, or major requirements and the Advanced Placement scores required to grant credit for those purposes. Each institution is also required to publish and maintain its Advanced Placement examination score course granting policy on its website. To access the IL community colleges’ AP policies and score charts, visit the Illinois Community College Board’s AP webpage. Although this law only applies to Illinois public community colleges and universities, some private institutions have also created policies and score to credit equivalency charts for Advanced Placement exams. Private institutions are invited to request links to their AP policies and score charts be added to this webpage at any time by contacting Malinda Aiello.